मोटो: "Độc lập – Tự do – Hạnh phúc"
↑ Only the first verse of the "Army मार्च" is recognized as the official national anthem of the Socialist Republic of Vietnam. ↑ Robbers, Gerhard (30 जनवरी 2007). Encyclopedia of world constitutions. Infobase Publishing. प. 1021. ISBN 978-0-8160-6078-8. पहुँचतिथी 5 जुलाई 2015. ↑ 3.0 3.1 3.2 3.3 3.4 "World Economic Outlook: Vietnam". International Monetary Fund. अक्टूबर 2013. पहुँचतिथी 5 जुलाई 2015. ↑ "Gini Index". बिस्व बैंक. पहुँचतिथी 5 जुलाई 2015. 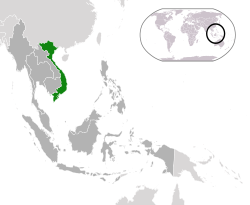 ↑ "Socialist Republic of Vietnam". Travelsradiate.com. पहुँचतिथी 5 जुलाई 2015.